Adam takes a look at the John Frankenheimer classic Birdman of Alcatraz starring the indomitable Burt Lancaster. 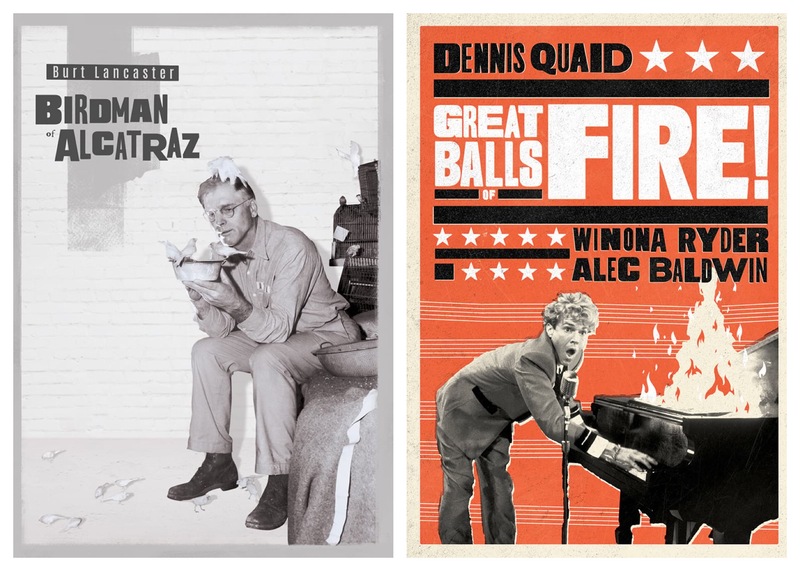 He also looks at the Jerry Lee Lewis Bio Pic, Great Balls of Fire!, starring Dennis Quaid and Winona Ryder. Both films were recently released on Blu-Ray and DVD by Olive Films. Few films have the simple power of John Frankenheimer’s Birdman of Alcatraz. Charting the life and imprisonment of Robert Stroud a man who is more than his prison sentence. Never played for maudlin effect the film is brilliant in the way it never feels as though it is preachy or an indictment of the penal system, though it does that very thing. Frankenheimer and Lancaster find themselves the perfect director and actor for this subject creating a classic film that still feels defiantly relevant today as it did over fifty years ago. At a little under two and half hours one would think that Birdman of Alcatraz could be a slog but it is anything but. Frankenheimer’s style and ability to bring you into Stroud’s life and its ever changing challenges that he faces. Stroud is never played as a saintly man. He killed someone in Alaska, which is what gives him his initial sentence and he kills a prison guard. These things though explained are never justified or made to feel righteous. It never claims that Stroud should have been sentenced but what it does do is shine a light onto how one can change. Part of the beauty of the film is the humanization of Stroud and those around him. It is through his chance encounter with a small sparrow and nursing it back to health is what starts his road back to humanity (and the title of the film). Though much more than just Ornithology within Prison, Birdman of Alcatraz has far too many surprises held within to ruin for someone who has never seen it. For those that have seen it, Birdman of Alcatraz retains all of its power. The transfer is beautifully reproduces the Brunett Guffey’s stark cinematography. A quick comparison to the Twilight Time Blu-Ray finds that this appears to be the same good transfer. Burford’s commentary dissects some of Birdman but as a whole discusses Lancaster’s career. Specifically where this project fell in his career, making the film, his relationship with Frankenheimer, and the afterlife of Birdman as a film. Birdman of Alcatraz is an uncommon film about prison and a man’s confinement. Though many films have been produced on this subject, none have been as skilled as this one. Olive Films has produced a quality transfer. Recommended! Complicated is the exact word this reviewer would use to sum up Great Balls of Fire! a film that has been all but forgotten since its release about thirty years ago. Dennis Quaid as Jerry Lee Lewis may be the actor’s greatest under seen performance in a career of under seen performances. Great Balls of Fire! is framed with that performance but it’s not enough to make this film a more also fascinating portrait of art that is greater than the artist. Part of the reason why is co-writer/director Jim McBride does not go far enough to bring a clear eyed view of a man who ruined what could have been a legendary career by marrying his thirteen year old cousin Myra Gale Brown (Winona Ryder) and drinking himself into an abusive stupor. Part of the complications is that McBride want to both hero worship to the point of myth making but apostatizing that idol. It creates a sort of inconsistent tone that the film never recovers from. One wishes after knowing more about Lewis’ story that McBride was able to go beyond the PG-13 rating to show Lewis as the hard and unsavory man he was. The film does attempt at something of creating a complicated portrait of a man who as unlikable as his music was infectious. The scenes of Quaid performing as Lewis are electric rivaling those similarly created for Luis Valdez’s La Bamba. It unfortunately isn’t able to fully succeed but remains a fascinating portrait of an artist and a truly great performance by Dennis Quaid. Great Balls of Fire! has never looked better. Having owned VHS and DVD versions of the film, the Olive Films Blu-Ray is a definite step up in quality. The films image is razor sharp. None were included in this release. Great Balls of Fire! looks and sounds amazing on Olive Films’ new Blu-Ray. Fans of the film will delight in having it in everyone’s Hi-Def format.